What pressure washer do I need for my application? Many ask us, “what pressure washer do I need?” – the following information should help! 1500 to 2000 PSI pressure washers are best for light duty applications such as cleaning patios, windows and window frames, garden equipment, garden sheds, bicycles, automobile tires, etc. 2000 to 3500 PSI pressure washers are suitable for more robust applications such as removing loose paint, mold, grime, embedded dust, mud, and dirt from surfaces and objects such as buildings, vehicles and concrete surfaces. This category of machine will also be able to successfully utilize additional features such as surface cleaners, sand blasters, extension hoses, etc. 3500 to 5000 PSI pressure washers are used for very demanding applications such as stucco cleaning, barn cleaning, driveways, pavers, etc. These pressure washers are best suited for professional applications and commercial pressure washing. If misused these washers could easily cause damage or injury. 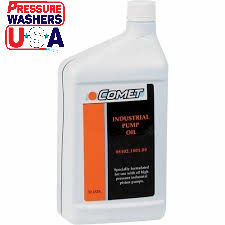 For de-greasing engines or equipment use hot water washers. The scope of your project will determine your pressure needs. 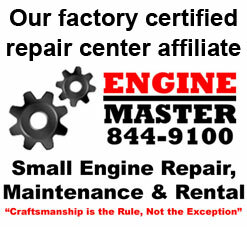 Occasional cleaning of a car engine, grill or spot on a driveway does not require super-high pressure (2000 psi or less is adequate), while weekly cleaning of heavy machinery or industrial equipment may require machines of 3000 psi or more. Cleaning siding with a pressure washer requires the correct method to fit the job. Low-pressure washing is a common technique used to avoid damage to the surface, especially when painted. Professional pressure washing contractors have used high pressure equipment in the past, however, low-pressure, high volume pressure washing equipment using specific cleaning solutions have been introduced to achieve effective cleaning while lowering the possibility of property damage. First, thoroughly wet all plants and the ground around the area to be cleaned to avoid killing plants, then apply the appropriate cleaner for the job and let it soak according to directions. Pressure clean the surface being sure not to get the tip too close to spray through gaps or damage paint, but close enough to do more than just rinse. When finished, be sure to thoroughly rinse the plants and grounds around the area to prevent damage. To remove graffiti can be more difficult. Cleaning siding with a pressure washer using high-pressure water in combination with cleaners aids in the removal. A hot-water washer is sometimes helpful, especially for crayon. Sometimes a pressurized mixture of water and sand is used to blast off the surface of the vandalized area, but this can etch and damage the surface. Graffiti using paints that bond with the siding offer few options, and sometimes have to be painted over. Pressure Washers can damage surfaces. High pressure washers can bore-through wood and masonry and strip the paint off surfaces. Be especially careful while using high pressure to avoid damaging the surface or causing personal injury. Water can be forced deep into bare wood, under planking and through cracks in masonry leading to an extended drying period. Such surfaces can appear dry after a short period, but still contain significant amounts of moisture that can hinder painting or sealing efforts. Be sure to give ample drying time before applying finishes. A pressure washer or power washer is a high-pressure mechanical sprayer used to remove loose paint, mold, grime, dust, mud, and dirt from surfaces and objects such as buildings, vehicles and concrete surfaces. The volume of a pressure washer is expressed in gallons or liters per minute, often designed into the pump and not variable. The pressure, expressed in pounds per square inch, pascals, or bar (deprecated but in common usage), is designed into the pump but can be varied by adjusting the unloader valve. Machines that produce pressures from 750 to 30,000 psi (5 to 200 MPa) or more are available. 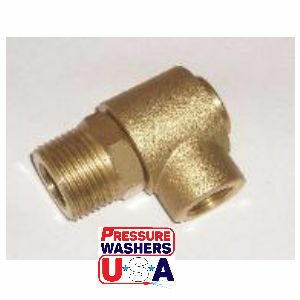 It is important that the water supply be adequate for the pressure washer connected to it, as water starvation will lead to cavitation and damage of the pump elements. Be sure your water source can provide the gallons per minute the pump requires. The basic pressure washer consists of a motor (either electric, internal combustion, pneumatic or hydraulic) that drives a high-pressure water pump, a high-pressure hose and a trigger gun-style switch. Just as a garden hose nozzle is used to increase the velocity of water, a pressure washer nozzle creates high pressure and velocity. Different types of nozzle are available for different application. Some nozzles create a water jet that is in a triangular plane (fan pattern), others emit a thin jet of water that spirals around rapidly (cone pattern). Nozzles that deliver a higher flow rate lower the output pressure. Most nozzles attach directly to the trigger gun. 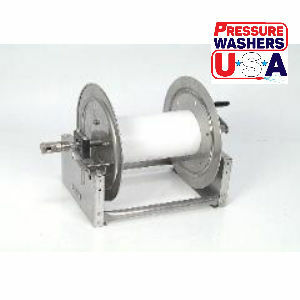 Some washers, with an appropriate nozzle, allow detergent to be introduced into the water stream, assisting in the cleaning process. Two types of chemical injectors are available — a high-pressure injector that introduces the chemical after the water leaves the pump (a downstream injector) and a low-pressure injector that introduces the chemical before water enters the pump (an upstream injector). The type of injector used is related to the type of detergent used, as there are many chemicals that will damage a pump if an upstream injector is used. Washers are dangerous tools and should be operated with due regard to safety instructions. The water pressure near the nozzle is powerful enough to strip flesh from bone. Particles in the water supply are ejected from the nozzle at great velocities. The cleaning process can propel objects dislodged from the surface being cleaned, also at great velocities. Pressure washers have a tendency to break up tarmac if aimed directly at it, due to high-pressure water entering cracks and voids in the surface. Most consumer washers are electric or gasoline-powered. Electric washers plug into a normal outlet, are supplied with tap water, and typically deliver pressure up to about 2,000 psi (140 bar). Gas powered washers can deliver twice that pressure, but due to the hazardous nature of the engine exhaust, they are unsuitable for enclosed or indoor areas. Some models can generate hot water, which is ideal for loosening and removing oil and grease. At extreme high pressure, water is used in many industrial cleaning applications requiring the removal of surface coatings and for dust-free cutting of some metals and concrete. For exterior applications, gas powered washers provide greater mobility than electric ones, as they do not require use in proximity to an electrical outlet. For indoor applications, electric washers produce no exhaust and are much quieter than gas or propane washers. 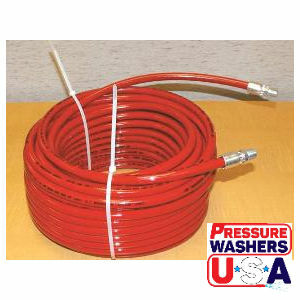 The majority of pressure washers nowadays connect to an existing water supply, like a garden hose, but some models store water in an attached tank. Usually there is an on/off button that controls the water stream and many models allow you to adjust the water pressure.